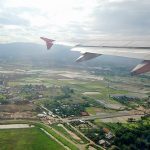 Khon Kaen is the most important transportation hub in Isaan due to its location in the center of the region. The Khon Kaen University is the oldest and largest university in the region. However Khon Kaen isn’t on most foreigners must-visit list and that’s mainly because they have no idea what to do in Khon Kaen. The nightlife there isn’t as foreign oriented as in other towns of Isaan (yet still a lot of fun if you know the right places to go) and almost nobody seems to be able naming just one attraction or landmark of Khon Kaen. 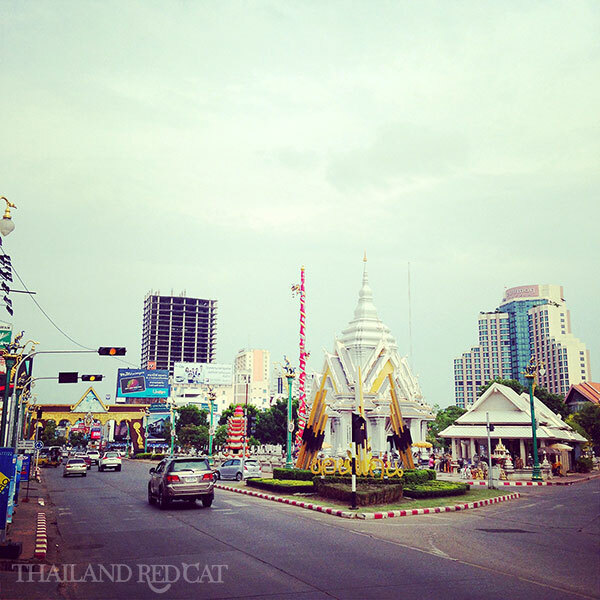 The town center of Khon Kaen is the area around the Chao Por Lak Muang Shrine (picture). That’s also where most of the nightlife spots as well as the majority of hotels are located. 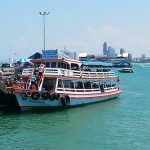 However, the attractions of Khon Kaen are spread all over town, a few are even out in the plains so you have to take a motorbike, tuk tuk, minivan or taxi (there are metered taxis starting from 32 Baht) to reach them. 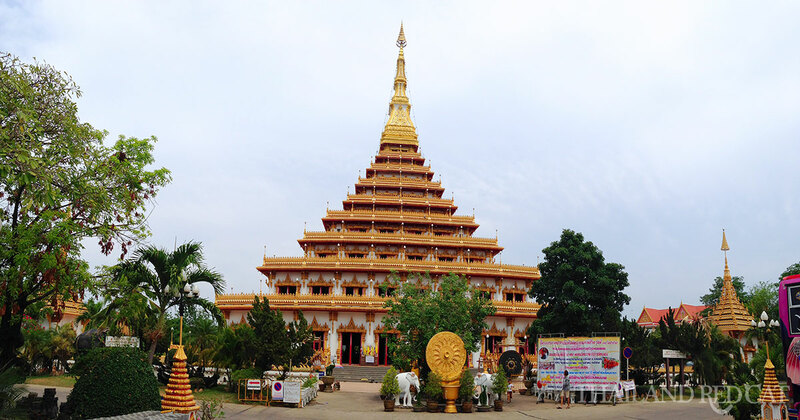 This beautifully shaped temple is not just the most important Buddhist monument in the region but also the most photographed landmark in Khon Kaen. And at 40 million Baht building cost the most expensive one. You can walk up the 9 increasingly smaller tiers of the Phra Mahathat Kaen Nakhon and reach an observation deck that offers stunning views all over Khon Kaen. I took a video of it – see below. There are also enlightening murals describing Isaan culture, several historical displays as well as a collection of rare Buddha images on the 4th floor. The main Buddha image is on the 1st floor and that’s where most people come to worship. Wat Nong Wang is located at the southern end of the Kaen Nakhon Lake (see the description below). A taxi or tuk tuk from downtown (e.g. Central Plaza) costs 80 to 100 Baht. There are a couple of lakes in Khon Kaen but the nicest and most popular one for locals and expats alike to hang out at is the Kaen Nakhon Lake. Every afternoon from around 4pm when the hottest time of the day is over you see a lot of young couples strolling around, renting a bicycle (30 Baht per hour) or just relaxing in the shade while eating some snacks from the locals selling street food. There are also several restaurants, bars and massage shops spread all around the lake. And there are more and more top modern condominiums being built, making lake side one of the most popular areas in Khon Kaen to live in – not just for locals but especially for the foreign expat community. The highlight for me and most fun place to visit during the day is the King Cobra Village about 54km north of Khon Kaen in a small village called Mo Ban Ngu Jong Ang (หมู่บ้านงูจงอาง). 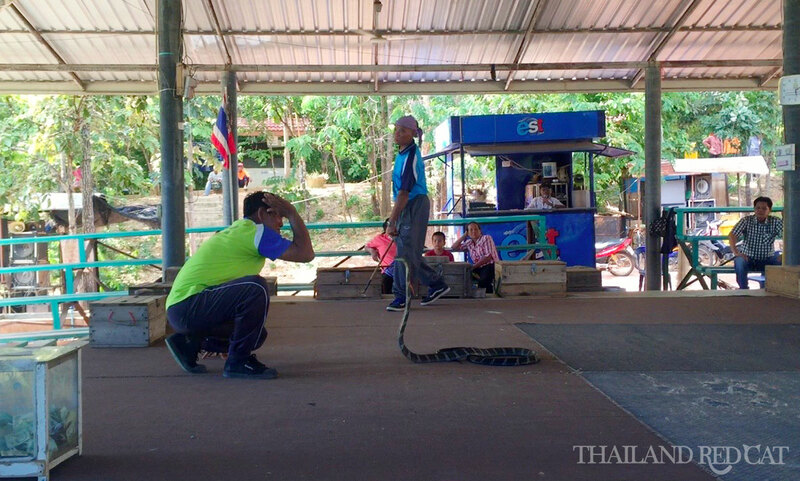 It’s really impressive to watch the Thai men “play” with the cobras while Muay Thai Music plays in the background. They also got small boys playing and girls dancing with other snakes. At the end of the show you’ll get the opportunity to take a snake around your neck for some extra tip. Make sure to watch my video at the end of the guide. Shows are daily from 9am till about 5pm, every hour or so depending on the demand. They usually wait until 70-80% of the benches are occupied. There’s no admission charge but they go around with buckets so you can put in 100 Baht or whatever you like. There’s also a shop selling snake oil and other herbal medicine. You see massive dinosaur sculptress all over the Khon Kaen province and the reason for this is that in 1976 a geologist from the US Geological Service found a piece of a bone which was then identified as a distal part of the left femur of a sauropod dinosaur (later called Siamo Tyrannus Isanesis). This is regarded as the first dinosaur discovery in Thailand and the Khon Kaen province proudly made it to their kind of marketing icon. Another species of the world which was first discovered in Thailand soon after is the Phuwiangosaurus Sirindhornae. The dinosaur attractions are located in the Phu Wiang National Park or just called “Dinosaur Park”. Most famous is the Dinosaur Museum that is exhibiting fossils (and apparently original ones, I asked), a research and investigation section and nice illustrations explaining the beginning of the universe and the origin and life of the dinosaurs (see the video I took there below). On a not-too-hot day you may also want to explore the other attractions of the park which include an areal with dinosaur sculptures, several walking treks leading to viewpoints and two big waterfalls, a reclining Buddha sculpture, a cycling trek and two camping sites. 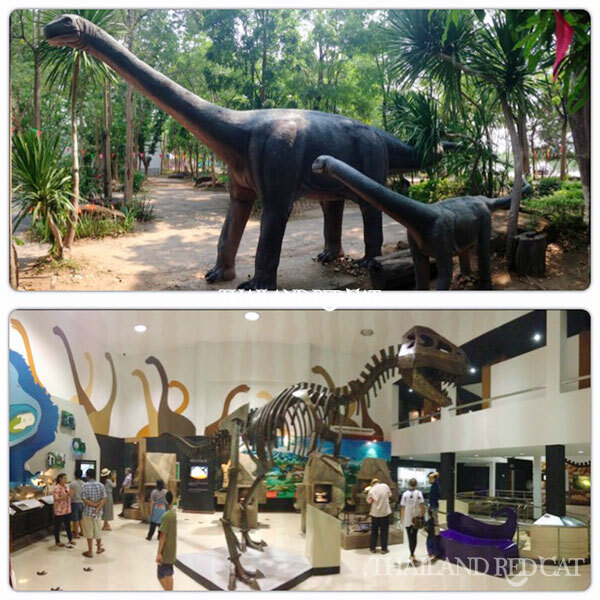 The Phu Wiang Dinosaur Park is located 71km west of Khon Kaen city. There is a regular minivan service connecting the two places (roughly every two hours, first service from Khon Kaen at 8:10am, last service from Phu Wiang at 4:30pm, one way fare 100 Baht, duration 1.5 hrs, see the location of the minivan terminal in Khon Kaen on the map below). The alternative is a taxi that will charge 1,000 Baht one way. It’s bloody hot in Isaan almost throughout the year and that’s why the locals rather hang out in air conditioned shopping malls or on the side of the road drinking whiskey than joining sports clubs and exercising in their free time. But of course gambling in Khon Kaen is just as popular as in the rest of the country and that’s why the Horse Race (in Thai Gaan Kɛ̀ɛng Máa / การแข่งม้า) held every Sunday on the “Be Bright” race track is kind of a big thing especially for the guys. Unfortunately there was no horse race when I came there a couple of weeks ago due to a public holiday (Chakri Day) so I’ll give it a try next time around. Khon Kaen FC may not be among the top clubs in Thailand but a 100 Baht for a ticket certainly isn’t wasted for watching a Thai League 2 (that’s the second tier league in Thai football). 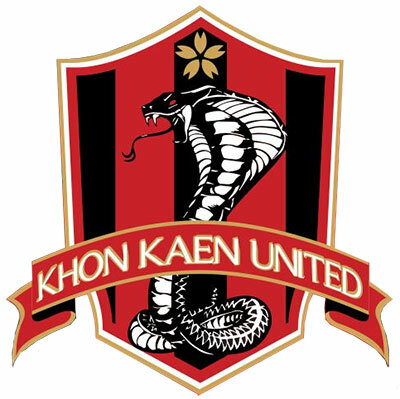 There’s also another team called Khon Kaen United. They currently play in the Thai League 4. The football stadium is located just 500m from the Kaen Nakhon Lake – see the map below. Check the schedule of matches on the official website. You may wonder if you really can call a shopping mall an attraction of a city but that’s just the case for so many province capitals, some are still so underdeveloped they are proud to have a Big C or Tesco Lotus. The Central Plaza is the most popular hangout place in Khon Kaen during daytime with countless of retail and department stores, cafes, restaurants, a western style supermarket and food court (Tops), a cinema, game area and bowling alley. The Central Plaza is located in the town center just five minutes walk from the Chao Por Lak Muang Shrine. It is open from Monday to Friday from 10:30am to 9:00pm and Saturday & Sunday from 10am to 9pm.